I was so excited to come back to Thai Bistro after so many months of not being able to dine here. I got to hand it over to Wazzup Pilipinas for this event as me and my blogger friends got the opportunity to meet with the owner, Chef Cecille Chang. When we got to sit down and talk to her, she is not someone who runs out of stories. She shares she just got back from a diving trip which explains her skin color. 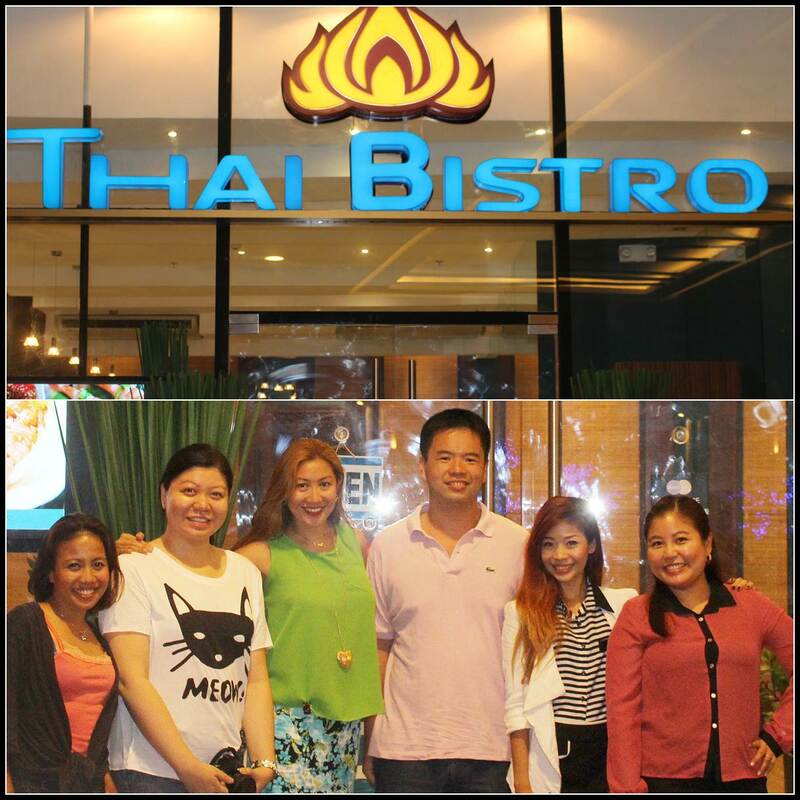 Thai Bistro opened at the same time as Robinson's Magnolia which is Aug. 13, 2012. She explains that she stayed at Bangkok for one year just to prepare for the opening of this restaurant. She also mentioned that the items that are displayed on the walls of the restaurant are items she bought from Bangkok. She tells us a lot of other bloggers have also blogged about Thai Bistro and she leads us to the front of the restaurant where there are some quotes from blog posts. I was surprised to find out I was actually one of the bloggers that are there. It is a shame I found out about that only now and it is a real privilege to be placed alongside famous bloggers. I told her that I only ordered Pad Thai, Chicken Curry and rice the last time I visited and she tells me there have been numerous additions since then which got me excited even more. Since I am a milk tea lover, I had Thai Green Milk tea for my drinks. It was indeed a great beverage to compliment the awesome food they have. I did not regret ordering that drink. To start the night off, we had Mieng Kham. It was vegetables topped with chili on top of it. This means customers have the option of eating it with or without the chili. I preferred to eat it without the chili since I have a low tolerance for spicy foods. I admitted right in the beginning that their Pad Thai is one of the best versions out there. After tasting it for a 2nd time, my opinion about that has not changed. Chef Cecille also tells us that her Pad Thai at her Thai Bistro food court stall downstairs is very different from this one so nobody should think it is the same. When you wrap the chicken with lettuce, the taste would be unforgettable. It would taste like ground pork at first but that would change soon enough. In my opinion, the Lamb Shank Massaman has got to be the highlight of the night. The other bloggers were also raving about the sweet potato chips as they claim it was addicting. Sadly, I did not focus on that because I was solely focused on eating the lamb as I took advantage of the fact that one of my co-blogger's preference of not eating pork. The lamb was tender and for me it really goes hand in hand with the bagoong rice and the pad thai. When our food even was nearing its twilight, the lamb was nearly gone but I still tried to find meat in it because it was THAT good. Since most of the bloggers were health conscious people, the bagoong rice was barely touched. However, when I got to taste it I must say it is a very fine version. Thai Ravioli showed the creativity of Chef Cecille as it is beef and mushrooms wrapped in rice paper. Everyone ignored this dish at the start but I told all of them they are making a mistake by ignoring this dish because it is a keeper. Sala Deang is lemongrass fillets stuffed with ground chicken. It is a very unique dish and it is possible customers would have a hard time getting the meat out. It is a good thing Chef Cecille was there and she taught us how to properly eat it. Come to think of it, it is not that hard to figure out. Takhoo Thai is creamy coconut custard topping on top of tapioca pearls. I am not really a fan of pearls but this combination really made me happy. The Bistro Nest stole the show. Just when everyone was already holding on to their full tummies, they just could not resist getting one bite after the other of this luscious dessert. It is coconut ice cream with the nest made out of taro and sweet potatoes. If you mix it with the chocolate sauce then you will feel like you are in heaven. This made me miss Thai Bistro too! Too bad I don't frequent Robsinson's Magnolia so I always end up trying out other new resto's there when visiting. This just made me all the more excited to visit Thai Bistro this Friday! :) I've already scheduled our trip, with the family. 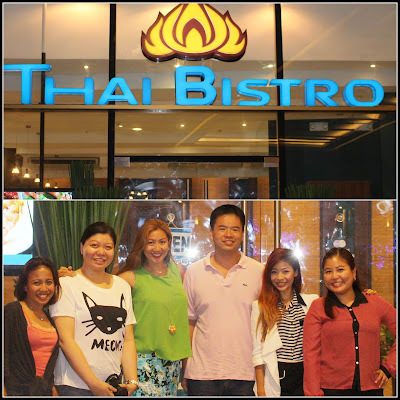 Will be sure not to miss the pad thai and bistro nest!